Footwear is notorious for bringing dirt into the workplace, so it is ideal to prevent it from being tracked in by removing the dirt at the door. 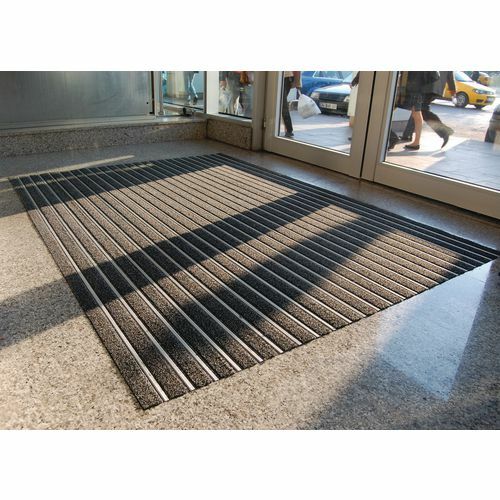 Our aluminium ribbed matting helps to stop dirt in its track and remove it from footwear at the entrance of a building. This grey carpet matting has raised aluminium ribs, which provide ultimate dirt scraping action and the fully closed surface stops dirt getting underneath the matting. The 100% polypropylene fibres add to the dirt trapping abilities of the mat and the latex backing prevents the mats from slipping. This matting is sold as a mat, which is available in a width of 1500mm and it is also available as a cut length in a width of 1000 or 2000mm. There are two colours to choose from; blue or grey and the matting has a total height of 13mm. Our aluminium ribbed matting is a great addition to your workplace entrance, helping to remove dirt from shoes coming in to the workplace. They come with FREE UK Delivery.